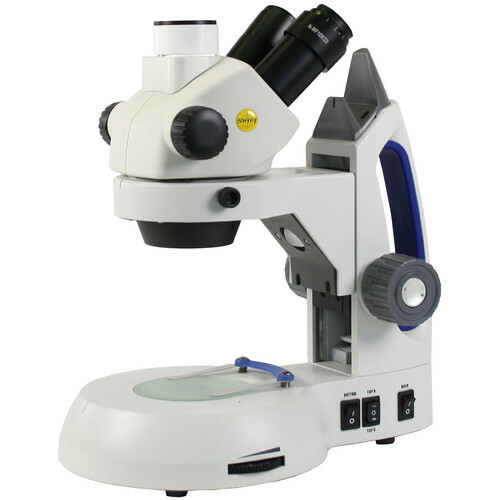 The Swift Optical SM105T-C Stereo 10x-30x Zoom Trinocular Microscope makes it easy and comfortable for groups of people to share the magnified view of large and small specimens through the eyepieces. Using a binocular head lets you view with both eyes open, which is not only more comfortable, but preserves true 3D stereoscopic vision with a rich depth of view. The two eyepieces are set at a comfortable 45° angle, and the eyepiece head rotates in a full 360° circle so people standing or sitting at a table or desk can all enjoy the view without having to have everyone move to the eyepieces. Optically the microscope is outfitted with two 10x power eyepieces that, when combined with the objectives, provide 10x, 20x, and 30x magnifications. The objectives are parfocal and parcentered, requiring little or no focus adjustment when changing magnifications and ensuring the same center of view for each objective so there will be no need to recenter specimens after changing objectives. These relatively low magnifications are ideal for larger objects like rocks and gems, textiles, models, circuit boards, and artwork. A diopter adjustment on the left eyepiece helps to compensate for individual eye strength and the eyepiece's interpupillary adjustment range makes it easy for all users to place their distance exactly where they need it. The stage is integrated into the base to offer improved stability for larger specimens. Upper and lower LED illuminators light the stage and independent power control allows you to have just the upper LED on, just the lower, or both. Two stage plates are included: a frosted glass that passes light without the harsh glare, and a reversible white/black contrast plate that provides a stark difference between your specimen and background to enhance the view. Stage is integrated into the base to provide a wide area for larger specimens like circuit boards, rocks, parchment, fabric, etc. Interpupillary Adjustment 55 to 75 mm / 2.2 to 3"